Hello 1stgen community! 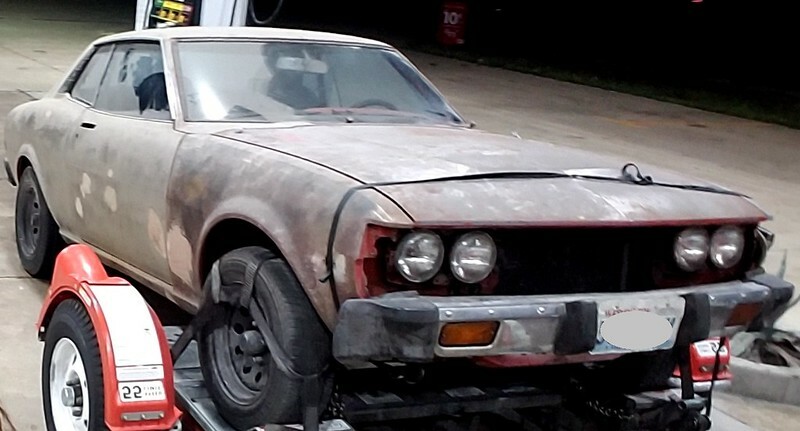 I just got my first project car, a 1976 RA24 Coupe , that my wife and I will be restoring. I look forward to the help and advice I receive and eventually give. Although her parents are Brits, I did get her (my wife) locally, and she's just as excited as I am to see this through. I picked up the car in Fort Worth with almost all of the parts (missing dash top, headliner, sun visors, radio, and AC compressor) for a mere $600! We finished loading her up at 11pm and towed her home... took 6 hours at a cautious 55 mph . The body was already sanded down to bare metal with very little rust, and she's almost ready for prime and paint. We're still debating on the color. We finally got the 21ru (w/ 5 speed w50 swap) that's installed fired up, but it won't hold idle and appears to have a head gasket leak... which gives me an excuse to do the engine swap I wanted ... I'm still researching which one to go with, so we'll see where it goes. Awesome! Our Houston group keeps getting bigger. Welcome! I have a 76 coupe I am parting out right now. Let me know if you need anything. No engine or trans though. So glad to see another Texan! Im in Grand Prairie (right between Dallas and FW). Im S-L-O-W-L-Y working on my 72 RA21. I have more aspirations than time, talent, or money!